« Do we need more Borises? Could the red team just lost some of the Ginger vote? 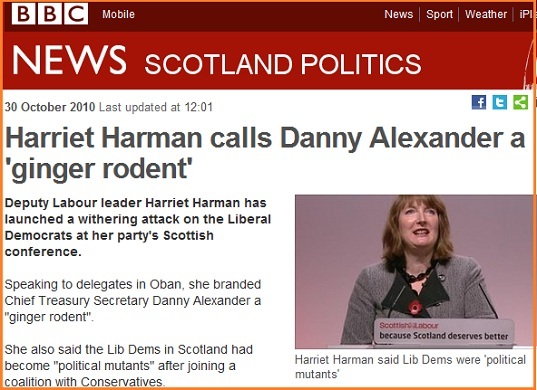 As the father of two children who were bullied at school because of their ginger hair I am beside myself with fury at Harriet Harman’s nasty attack on Danny Alexander as being a “ginger rodent”. By all means get into an argument on the issues but to use an inherited bodily characteristic to attack someone smacks of racism – which is even more outrageous given Harriet’s record in the equality area. Would she have done the same over gender, race or sexual orientation? I doubt it – so what makes someone’s hair colour, which is determined by their genetic make-up, a legitimate target? How are ginger men and women voters going to feel about a party that uses this as a means of attack and ridicule. Harriet – this is stupid.